Lantelme in a dress by Doucet. 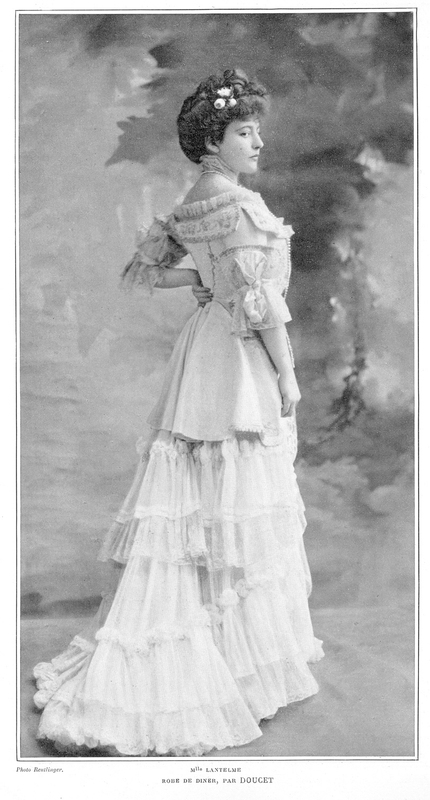 Scan from Les Modes, July 1905. Caption: ROBE DE DINER – Doucet. – Habit en taffetas rose, col et revers des manches brodés en plusieurs tons, noeuds de rubans. Jupe de mousseline en soie blanche, garnie de ruches de mousseline et de dentelle blanche. A lot of interesting photos and a good work! I hope your book must be very interesting. I’m a polish writer and with my friend we write a book about Paris and a belle epoque in polish. We had some problems with a date of birth of Genevieve Lantelme. We know, that 1887 is rather wrong (her stage debut in 1901!). We wish you a lot of luck, with your book! Hi, her birthdate is really a problem! An article in Le Theatre says she was born in 1882, and the book of Mayen insists on 1883. I don’t know who first mentioned 1887, but I didn’t see this nowhere in the sources.So Lantelme was born in Paris in 1882 or 1883. And Your book is finished now or You are still working on? It has been published and then appeared in second edition. But it’s not a biography, it’s a novel. I see. Congratulations then! And it’s in Russian, I suppose? Lantelme was interesting to me because of Misia Edwards (Natanson-Sert), who was Polish “queen of Paris”. Have you mentionned about her? Yes, it’s in Russian. No, I didn’t mention madame Sert because I don’t like this person. But it’s true that first time I met Lantelme’s name in an article about Misia. If you write a book about belle epoque, you should also write about another actress with very interesting destiny, it’s Eve Lavalliere who after theatre turned to religion.And she also was queen of Paris, like Lantelme whose surname was la Petite reine magique (little magic qeeen). It’s an interesting suggestion, thanks. Our book is a sort of panorama of Paris between 1870 and 1914 with a lot of photos, so we have no much place to write about everything. Yes, I know this kind of books very well 🙂 I hope you will also write about Ladislas Starevitch, the inventor of animation movies, who is of Polish origin. 100 years ago Khanzhonkov movie company issued his first animation movies.